Employee morale plays a vital role in the performance of the organization. Morale can be considered as the total satisfaction that the employees of the organization derive from their job, the prevailing atmosphere and the factors that appeal to them. It is a conglomeration of attitudes and feelings that constitute a reserve of physical and mental strength including factors like self-confidence, optimism and a positive mental attitude. Morale is an invisible element which determines the success or failure of the organization. Morale is a way of describing how employees feel about their jobs, management and the organization. These feelings are tied to the behaviours and attitudes which the employees show in their workplace. When employees have good morale, they feel committed to the management and the organization, loyal to their jobs and motivated to be productive. They work harder, produce more, meet deadlines and give it their all. Low morale of the employees takes a toll on employees’ performance and productivity. Employee morale is related to how the employees feel about the organization. It is an important factor in creating a healthy work environment. Organization which has higher employee morale displays improved productivity, improved performance and creativity, reduced number of days taken for leave, higher attention to details, a safer workplace, and an increased quality of work. In addition to that, the organization has employees who arrive to work on time, communicate better, waste lesser time in gossip, have higher rate of retention, and are more creative. Moreover, employees who work with high morale develop higher rates of job satisfaction, creativeness and innovation, respect for their own job, commitment to the organization, eagerness to satisfy group objectives instead of individual objectives, and desire to improve the organizational performance. On the other hand, low employee morale can be costly to the organization because of loss of productivity, strikes, lack of motivation and interest, decreased efficiency, higher rate of absenteeism, errors, and turnover, and poor customer service. Signs of low morale include non-cooperative and negative attitudes, fault-finding, complaining, increased tardiness, gossiping, and backstabbing. Morale can often become so bad that the employees frequently discuss openly what a terrible organization they work for and it becomes the common bond among employees. Employee morale is expressed as the depiction of the employees’ attitude, emotions, satisfaction and overall point of view towards their organization. Increased morale makes an employee happier and more productive, and higher productivity leads to higher performance and increased customer satisfaction. Morale is a state of mind which involves feelings and emotions. It is the most important psychological state of mind of the employee which is expressed as self-confidence, loyalty toward the organization and/or enthusiasm. Created within each employee, it is often considered an elusive quality. It involves the attitude and perception towards the job, work environment, team members, managers and the organization on a whole. Positive employee morale is usually exhibited by self-confidence, discipline, willingness to perform, loyalty toward the organization and/or enthusiasm. Morale of the employees determines their behaviour which brings either positivity or negativity in the organization. Morale is directly related to employees’ motivation level and satisfaction in their job. Morale ultimately reflects in the performance of the employees and leads to their retention. Morale is fundamentally a psychological factor. It is defined in many ways. The factors which help to define morale are intrinsic motivation, job satisfaction, work meaningfulness, organizational commitment, and work pride. Morale can be described as “the degree to which employees feel good about their work and work environment” It may also be defined as an attitude of satisfaction with the desire to strive for the goals of a particular group. Morale is purely emotional. It is not a static thing since it changes depending upon working conditions. Morale can be defined as the job satisfaction, outlook, and feelings of well-being an employee has within a workplace setting. It has a positive effect on productivity and it is one of the corner stones of the performance of the organization. Morale can be defined as an employee’s attitude towards being part of a group or organization. It reflects the satisfaction and sense of achievement that the employee gets from being part of the organization. High morale means the interest in being part of the organization and a possible desire to do something better. Morale can also be defined as the total satisfaction that the employees derive from their job, the prevailing atmosphere and the factors which appeal to their individual propensities. It is a summary of attitudes and feelings which constitute a reserve of physical and mental strength including factors like self-confidence, optimism and a positive mental attitude. Morale can also be defined as the total satisfaction derived by an individual from his job, his work-group, his superior, the organization he works for and the environment. It generally relates to the feeling of individual’s comfort, happiness and satisfaction. Morale can also be defined as “the mental condition or attitude of individual and groups which determines their willingness to co-operate”. Morale is basically a group phenomenon. It describes the level of favourable or unfavorable attitudes. Morale in general sense is referred to ‘willingness to work’. High morale is the result of job-satisfaction which is again the result of motivational attitude of the management. There are following three main approaches to morale. Classical approach assumes that satisfaction of basic needs is the symbols of morale. Need satisfaction leads to high morale. Psychological approach emphasizes that apart from the basic needs, psychological needs also influence the morale of the employees. Social approach recognizes the morale as social phenomenon which persuades the employees to live in society or groups in achieving the common goal. Both the individual and group morale are important for the organization. Individual morale is a single employee’s attitude towards work, environment etc., whereas group morale reflect the general attitude of a group of the employees. Group morale which is the management’s concern may go on changing with the passage of time. Individual and group morale are inter-related but not necessarily identical. They have an effect on each other. The individual’s personal perception of the present conditions may be high but the group’s perception may be low or vice-versa. Morale is basically a matter of human behaviour. It is an expression of the attitudes which the employees of the organization develop and adapt towards the organization and its employees, purposes and management. It refers to the total satisfaction which the employees derive from their job, their work group, their manager, the organization and the general environment. It is reflected in the employees’ general feeling of well-being, satisfaction and happiness. In short, morale is a fusion of employees’ attitudes, behaviours, manifestation of views and opinions – all taken together in their work scenarios, showing the employees’ feelings towards work, working terms and relationship with the management. Morale includes employees’ attitudes on and specific reaction to their job. It is considered as the end results of many factors present in the workplace environment which include (i) work setting, (ii) employee satisfaction, (iii) salary, (iv) supervisory input, and (v) working conditions and status. Some of the signs for decreased morale include (i) tardiness, (ii) absenteeism, (iii) apathy and dejection, (iv) back stabbing, (v) decreased work quality, (vi) decreased productivity, and (vii) increased errors, accidents and injuries. There are two states of morale namely (i) high morale, and (ii) low morale. High morale implies determination at work which is an essential in achievement of management objectives. It is a powerful driver of the performance of the organization. It results in (i) a keen teamwork on part of the employees, (ii) organizational commitment and a sense of belongingness in the employees mind, (iii) immediate conflict identification and resolution, (iv) healthy and safe work environment, (v) effective communication in the organization, (vi) increased productivity, (vii) greater motivation, and (vii) higher customer satisfaction. 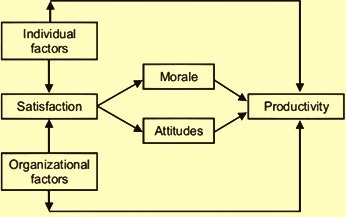 Low morale has the features which include (i) greater grievances and conflicts in organization, (ii) high rate of employee absenteeism and turnover, (iii) dissatisfaction with the superiors and management, (iv) poor working conditions, (v) employees’ frustration, (vi) decrease in productivity, and (vii) lack of motivation. The organization needs employees with high morale and since morale being a psychological factor, necessary measures are required to be taken to build a high level of morale in an employee’s mindset. The employee morale is a very complex phenomenon and is influenced by many factors. There are several criteria for the determination of morale. On the basis of all these criteria, the important factors for the determination of levels of morale of the employees of the organization are given below. Organization – The first factor affecting the employee morale is the organization itself. The organization influences employees’ attitudes to their jobs. The reputation of the organization can build up employees’ attitudes for the better or for the worse and hence affect the morale of the employees accordingly. Confidence in management – If employees feel that the organizational management is competent, then the employees’ morale remains high as employees’ expectations of the organizational success remain intact. When management proves to be incompetent, then the entire organization can suffer from a drop in morale which can be counter-productive. Change of manager – Employees can become accustomed to the practices and methods of a particular manager, and when there is a change in manager, it can have an effect on morale. It can also depend on the circumstances that caused the change. Nature of the work – Nature of the work, the employees are expected to perform also affects their attitude towards the job as well as their morale. If the employees are expected to perform routine or specialized jobs, they feel bored and alienated. Repetition of the same task again and again makes the working situation worse. Another factor is the large impersonal organizational structure. Sometimes, if the employees feel that they are just parts of the machine instead of a person, their morale become very low. Lack of understanding of organizational goals can also affect the morale. Level of satisfaction – Level of satisfaction, which the employees derive from their job, is another determinant of morale. If the job features and the satisfaction which these features bring in, are perceived favourable by the employees then the morale tends to be higher than the case when these features perceived by the employees as unfavourable. The job features include such aspects as opportunities for promotions, job security, steadiness of employment, opportunities to learn and to use employee’s own ideas, salary, working conditions, recognition, cooperativeness of co-employees, and group relationship etc. Level of supervision – Level of supervision received by employees has very big influence on their morale. High rate of employee turnover indicates that the leadership is ineffective. On the other hand, if employees are given freedom to do their job, their morale is always high since no one likes to be supervised all the time. Concept of self – The concept of the employees about themselves influences their attitude towards the organizational environment. The employees’ perception about themselves is a very important matter. The morale of the employees who have lots of self-confidence or who enjoy good mental and physical health is generally high as compared to those who lack self-confidence or suffer from poor physical or mental health. Employees’ perception for reward system – Employee morale is impacted by the opportunities and recognition that the organization offers. If some employees are recognized for their efforts through a promotion, then the rest of the employees notice that the organization reward hard work. Morale can be negatively impacted if employees feel that the organization offers no career path with advancement or if the organization does not offer some kind of reward for employee loyalty and dedication. The employees’ perception for past rewards and future opportunities for rewards affect their morale to a substantial extent. If the employees regard the rewards as fair and satisfactory, their morale tend to be higher than if the perception is opposite. Also, if the rewards and opportunities for the future tend to be bleak, morale tend to be low as compared to the situation where the employees perceive that there are opportunities for rewards in the future. Age of the employees – Different studies have shown that the employees’ age and morale are directly related. Other things being equal, employees with higher age seem to have higher morale. This is since younger employees have higher expectations and hence are more dissatisfied than the older employees. The older employees have more stability which comes with maturity, a serious attitude towards job, more reliability, less absenteeism, proven steady work habits, a sense of responsibility and loyalty, and lesser tendency to be influenced and distracted by outside interests. Educational level of the employees – Various studies have shown an inverse relationship between the morale of the employees and their educational level. Higher is the educational level of the employees, lower is their job satisfaction and vice versa. With education, employees’ power for analyzing different situations improves and soon their job does not provide required job satisfaction and it affects adversely their morale. Occupational level of the employees – The occupational level of the employees also influences their morale. Employees who are higher up in organizational hierarchy have generally higher level of morale while the morale of the employees who are lower in the levels of hierarchy is normally lower since they compare their own attainment with those employees at the higher level. Employees’ activities outside official duties – The family environment of the employees and the environment existing in their friends circle greatly influences their behaviour and attitude during their working time. Their off the job activities as well the extra-curricular activities affect their behaviour during the working hours. Such influences have significant effects on the morale of the employees. Communication – Organizations have many levels of communication such as from management to employees, between departments, between management groups and between individual employees. To maintain morale, communication lines need to remain open and important information is required to be delivered in a timely fashion. Employees getting information through rumours and not by the formal channels, has an adverse impact on the employees morale. Measuring of the employees’ morale lets the organizational management diagnose and treat any morale issues before they become more problematic. Employee satisfaction survey is one of the ways to measure morale since they capture information about the strengths and weaknesses of the organization, as judged by the employees. Questions are formulated to find out if employees are happy, if they like their jobs and what improvements they think are to be made in the workplace. Morale can also be measured through observation. Common behaviours in a workplace with low morale include employees appearing less enthusiastic and energetic, turning in assignments late and not performing at previous levels. Morale reflects the attitude of employees towards their work. Its relationship with productivity is described here. Different studies have revealed that there is no direct relationship between morale and productivity. High morale may lead to higher productivity but in some cases high morale and low productivity are also visible together. It is generally felt that there is a positive relation between morale and productivity but the degree may not be the same. For example, certain percent increase in morale may lead to higher productivity but production may not necessarily increase by the same percent. Different studies also support the view that morale and productivity are not perfectly related, though there is a positive correlation between the two. There is no direct and positive relationship between the two. The four combinations of productivity and morale as given below are (i) high productivity-high morale; (ii) low productivity-high morale; (iii) high productivity low morale and (iv) low productivity-low morale. The effect of these combinations is shown in Fig 1. High morale with high productivity where proper motivation and supervision exist. Low morale with low productivity exists where motivation and supervision are defective. High morale with low productivity exists where employees are not fully trained and supervise incompetent. Low morale with high productivity exists where management is anti-employees or production oriented. The first situation occurs when the employees are satisfied from the job and prevailing environment. They achieve the standards of performance which lead to higher productivity. In the second situation (low productivity and high morale) the employees are satisfied from their work and situations, prevailing and showing high morale. Lack of proper training of the employees, lack of administrative skill of supervisor, defective materials, and outdated technology can lead to low productivity in spite of high morale. In the third situation, management uses strict supervision, prescribes punishments for low productivity and uses better technology for increasing the productivity, in spite of low morale. The fourth situation occurs where factors obtained in combination of high productivity and high morale are lacking. There is a complexity of relationship between morale and productivity. This relationship cannot always be predicted. It may differ from organization to organization and from one time to another time. It is quite possible to increase morale with either favourable or unfavourable shifts in productivity as shown in Fig 1. Since morale reflects attitude of employees, there are a number of variables available between employee’s attitude and productivity. An attitude in the individual tends to interpret, understand, or define a situation or relationship with others. Attitudes are the individual’s likes or dislikes directed towards persons, things, or situations, or combinations of all these. Since all expressed attitudes are not to be put into practice, it is expected that morale is not exactly related to the productivity. A more accurate statement about high morale is that it indicates a predisposition to be more productive if leadership is effective along with proper production facilities and individual’s ability. Such factors are presented in Fig 2. This shows that productivity is a function of four factors namely (i) organizational factors, (ii) individual factors, (iii) attitudes, and (iv) morale. Attitudes and morale, in turn, are determined by the satisfaction of individuals which is again affected by organizational and individual factors. Thus, productivity is a function of several variables in which morale is the major one. The successful managers recognize that behavioural management requires a positive integration of goals so that people working together will achieve the desirable high morale with high productivity. Though it is possible to achieve high productivity with low morale as shown in Fig1 (line C), this position cannot continue for long because in the long run employee will show their resistance, dissatisfaction and restriction which eventually lead to low productivity. 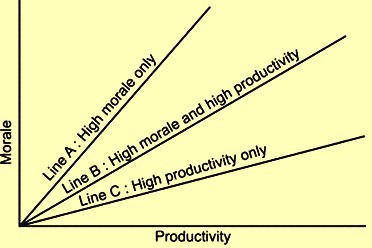 Factors that determine productivity are shown in Fig 2.